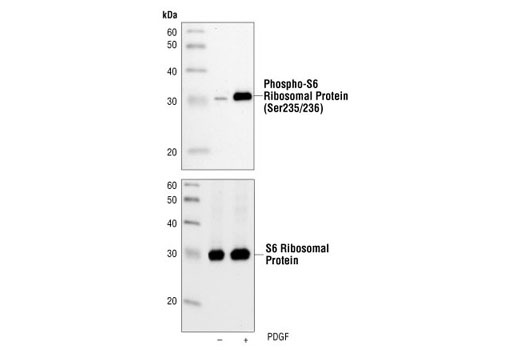 Western blot analysis of extracts from NIH/3T3 cells, untreated or PDGF-treated (100 ng/ml, 20 min), using Phospho-S6 Ribosomal Protein (Ser235/236) (2F9) Rabbit mAb (upper) or S6 Ribosomal Protein (5G10) Rabbit mAb #2217 (lower). 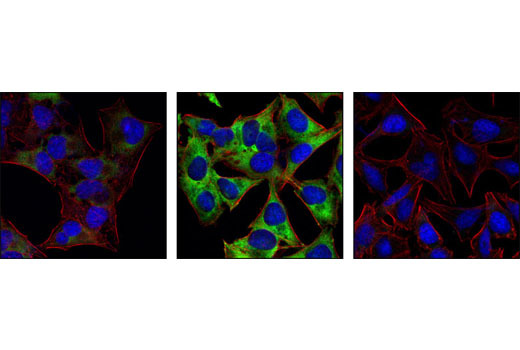 Confocal immunofluorescent images of HeLa cells serum-starved for 20 hrs (left), 20% serum-treated (center), or 20% serum-treated after preincubation with Rapamycin (FRAP/mTOR Inhibitor) #9904 and labeled with Phospho-S6 Ribosomal Protein (Ser235/236) (2F9) Rabbit mAb (green). Actin filaments have been labeled with Alexa Fluor® 555 phalloidin (red). Blue pseudocolor = DRAQ5™ (fluorescent DNA dye). 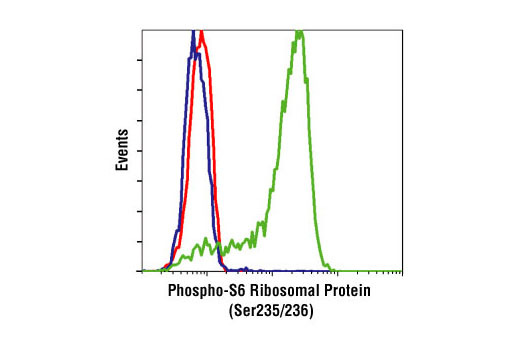 Flow cytometric analysis of Jurkat cells, untreated (green), or LY294002, Wortmannin and U0126-treated (blue), using Phospho-S6 Ribosomal Protein (Ser235/236) (2F9) Rabbit mAb compared to a nonspecific negative control antibody (red). Kotecha, N. et al. (2008) Cancer Cell 14, 335-43.